Hamsters are amazing pets to have in your home, especially if you have kids. They teach kids a sense of responsibility and also are fun to see them play in their cages. To make your hamster feel safe and at home, you need to get it the best cage. On top of that, you will need to accessorize the cage with toys and hamster beddings. While in the wild, hamster burrow into the ground where they create nests. The kind of nest hamsters build as well as the materials they use to create these nests depend on their natural habitat and type of hamster. For instance, Russian hamsters are found in dry grass plains and use grass to build their nests. On the other hand, Syrian hamsters live in hot, dry environments, and thus they dig underground to create their homes. This means that you will need to know the natural habitat of your hamster and provide beddings that makes its cage look like a natural habitat to them. So, You May Ask, Why Should I Find the Best Hamster Bedding? Well, Read On to Learn More. Why Are Hamster Beddings Important? How much is hamster bedding? What is the ideal depth of hamster bedding? How do you the bedding is safe? How often should you change hamster bedding? When in the wild, hamsters will burrow into the ground where they build nests. The material they use to build and the type of nests they build majorly depends on their natural environment and type of hamster. For instance, a Syrian hamster lives in the hot-dry environment and thus digs deep into the sandy soil and build nests. Campbell Russian hamster is found in dry grass plains and build their nests with sheep’s wool and grass. When keeping any hamster as a pet, you need to offer it virtually everything it can find in its natural environment. This will enable it to express itself better and live happily. This means it is essential to find the right bedding for hamsters. You need to find beddings that your hamsters can use to make a bed- the same way they would do in the wild. However, ensure that the same beddings are more comfortable, safer, and absorbent. Beddings offer comfort to your hamster- hamsters like to build their nests underground. Therefore, if you want to make your hamster feel as comfortable as possible in their cage, then it is essential to replicate the wild environment in the cages. Proper beddings will help achieve that. Absorbs odor and moisture. The amount of absorption of hamster’s urine depends on the beddings. With enough beddings, all the hamster’s poop and urine will be absorbed thereby reducing the pungent smell of their urine and prevent it from spreading to the surrounding areas. Pet’s entertainment. Hamsters like eating their beddings and digging through it. If you generously offer enough beddings, you will find them playing on it. Of course, hamster beddings are made of different materials. Some are safe while others are not. Let’s discuss the materials to avoid. Not all bedding materials sold by hamster bedding brands are suitable for your pet. Unfortunately, many unsuitable materials are available, and many people are ending up buying them because of the lack of necessary knowledge. For example, some hamsters bedding brands sell hamster bedding pine and hamster bedding cedar. We do not recommend using these materials in your cages. Pine and cedar wood can splinter into sharp pieces and become abrasive. These sharp splinters can cut your hamster thereby causing injuries which may lead to infection. Pine and cedar woods also give off toxic fumes when they react with hamster’s urine, and this can create an uncomfortable environment for your hamster. Fluffy beddings are also other materials to avoid. Most pet owners are often tempted to go for fluffy hamster beddings because they are soft. Understandably, they want their hamster to feel comfortable sleeping on them. However, considering that hamsters like chewing anything they come across, these beddings can be unsafe for them. Made from artificial fibers, these lousy hamster bedding can be difficult to digest when swallowed. Besides, because of their small, fragile legs, hamsters can get tangled in fluffy beddings and injure themselves. You will probably see hamster beddings made of cedar and pine shavings, but believe me, neither of these is safe for your hamster. They can cause liver damage and respiratory issues. Wood shavings tend to be inexpensive and thus many pet owners get tempted to buy them. If you are looking for hamster bedding cheap made of wood shavings, go for aspen- these are safe for most hamsters. There are pros and cons of wood shavings. While they are highly absorbent, they are not great at controlling odor. They are also messy because they easily get stuck on hamster’s fur and also spread in their cages. This is not a good bedding material for hamsters. They are not absorbent and can create a mess. That said, if you keep your hamster outdoor, straw is a great material thanks to its insulation. Besides, hamsters such as rabbits love to snack on straw and thus this will give them an extra treat. For people whose hamsters are inside the house, avoid this bedding material. Being one of the cheapest options, most people tend to put them in a hamster cage as beddings. However, keep in mind that shredded newspaper doesn’t control odors and thus will need to be replaced often. They are cheap and easy to find, but they can be dangerous. If your hamster likes to chew its beddings, then these beddings will be unsafe for your pet as they are indigestible when ingested in large quantities. They can cause blockage of intestines. If you have to use this type of bedding, put it under another bedding to act as a base layer. They offer an extra layer of absorption and can make it easier to change your hamster’s bedding when laid without being shredded. If you choose to use them as a base layer, make sure to have enough bedding materials on top of them so that your hamster can’t chew it. First, if accidentally ingested, cat litter can clump up in the hamster’s digestive system thereby causing complications that may lead to death. Secondly, they can be dusty, which can cause respiratory problems for your hamster or other people in your home with asthma or allergies. Scented hamster beddings contain chemicals, and although it may smell fresh and nice to you, the scent can cause respiratory problems for your hamster. Therefore, avoid scented beddings at all cost. This is one of the most popular types of hamster bedding on the market. The primary reasons for this are because it is relatively cheaper, absorbs well, is readily available, and can be found in large and small bags. Though popular, we advise pet owners to stay away from wood shavings that are overly scented as they are likely to cause respiratory issues to your hamster. Besides, some hamster bedding brands using wood shavings have a lot of dust that can be dangerous to a hamster. Excessive dust can also find its way into your home, and this can be problematic to asthmatic people. Therefore, consider going for hamster beddings made of aspen shavings. The woody oil content of shavings of aspen material makes it suitable for your hamster as it won’t affect her respiratory system. These are some of the most popular beddings for dwarf hamsters. Besides, they beddings made out of aspen shavings are not pricey either. Cellulose fiber is another excellent absorbent bedding that is also durable. Bedding made from cellulose fiber can outlast bedding made from aspen shavings, making it a better alternative. Beddings made from aspen pellets are ideal for hamsters as they are known to control bad odors. It is also a good absorbent. In addition to this, beddings made from aspen pellets are recyclable and do not cause harm if chewed and ingested. Wood Pulp bedding forms a wonderful hamster bed. They are a safe bedding alternative created from recycled pump waste. This soft material is very comfortable for your hamster to sit on. It also offers good insulation, though it can be carried away if you have your cage placed in an area with a lot of wind. Wood pulp is known for its absorbency and is one of the most popular types of hamster beddings. It is free from things such as clay, inks, chemicals, and dyes used in papermaking. This is relatively rounded bedding that some pet owners purchase as hamster’s food. It is well insulated, but it is not as comfortable as other materials. Pet owners with rabbits as hamsters find this type of hay better for use as beddings. If you have a small hamster cage and you want beddings that will not expand a lot, shredded cardboard is a good option. Plus, they are also recycled. In addition to this, they offer excellent insulation, which means your hamster will stay warm, even if you keep them outside. The softened material of this bedding materials makes them very comfortable and warm. It is a great bedding option for most hamsters. However, the main weakness of this bedding material is that it is not a great absorbent and thus will need to be replaced more often than other types of beddings. Always remember to choose thread-less fleece beddings as most hamsters like to chew anything; loose threads can lead to digestion issues. These are another excellent hamster bed materials thanks to their natural and environmentally-friendly nature. These are very eco-friendly since they are made of recycled paper. They are relatively lightweight and highly absorbent. These beddings are suitable for use in small hamster cages as they don’t scatter a lot. They make an excellent bedding option for most hamsters. Also, paper pellets do not snarl in the fur of long-haired hamsters. When looking for hamster beddings for sale, there are a couple of factors that you need to keep in mind. These factors will help you find perfect and cozy bedding that your hamster can sleep in. Quality beddings enhance your hamster’s bonding with you and their happiness. Here are some of the essential pointers to look into when buying best hamster bedding 2019. One of the most important features to look into when buying beddings for your hamster is how safe they are. As mentioned before, hamsters like to chew or swallow bedding materials when they are building a nest. You should, therefore, ensure the bedding material you choose doesn’t cause any harm to your hamster if swallowed. 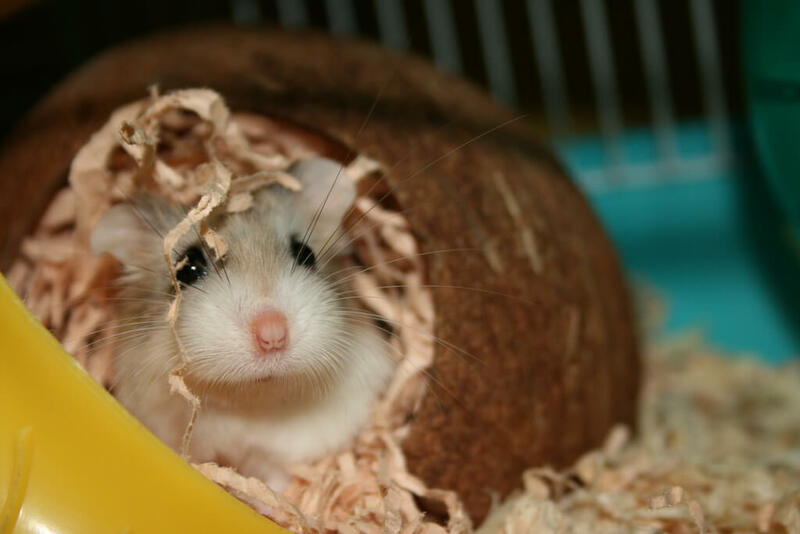 Cotton wool should never be used as a hamster bedding material since it can clog up the digestive tract if consumed. Another significant pointer to keep in mind when buying bedding for hamsters is their absorbency. You need bedding that absorbs as much liquid as possible as this means minor maintenance. This will not only help keep a hamster cage in good condition but also means you will add fewer shavings. Hamsters are not scent-free pets as many people would think. In fact, hamster urine stinks a lot, especially when it has been left to build up over a few days. A quality hamster bedding will, therefore, absorb liquid and excess moisture and also manage to control the urine odor before you replace the beddings. You don’t want lousy odor to dominate your house because hamster urine can have an overpowering smell. Go for bedding with a block formula or strong odor control to keep your hamster cage fresh and welcoming. A Hamster bedding needs to be comfortable for your pet to use. Attempting to build a nest out of spikey materials or walking across rough beddings is unlikely to make your hamster feel at home. Ideally, smoother and softer bedding materials tend to be the best option. This depends on your hamster’s size and the amount of time you want the beddings to last. You also need to consider if there is a bargain price for bulk buying as some hamster bedding brands offer large quantities of beddings at reasonable prices. Others might be overly costly because of the features they pack. Crumble, and paper-based beddings usually pack a lot of dust particles in them. This makes it difficult to clean the cage. Besides, excessive dust can cause respiratory issues to your pet and allergic people as well. Therefore, ensure you get a dust-free bedding package. There are different types of hamster beddings as we have discussed earlier. It is up to you to decide the most comfortable bedding for your furry friend. Therefore, choose one that suits your pet. So, now that you have all the information you need to choose the best hamster beddings, it is the best moment to review the top-rated hamster beddings on the market. After few days of research, analysis, and extensive consultation with pet owners and pet experts, these 5 products emerged as the best hamster beddings. They are safe, comfortable, and are good absorbents, and they are manufactured by brands that are reputable. The hamster bedding Kaytee bag arrives compressed for easy shipping and storage, but the contents expand to stated volume. Aspen shavings are a suitable substrate for your hamster cage and should be hamster-safe. The hardwood does not contain the aromatic oils found in other bedding, and this makes it safe. The bedding is highly absorbent and thus will eliminate odors and can decay naturally for safe disposal. The Vitakraft hamster bedding will keep your hamster’s habitat smelling fresh for a long time. It is made of soft crumbles that feature an odor-block formula that can absorb moisture rapidly and stay for up to 14 days. The US-made recycled hamster bedding is non-toxic and completely safe for your pet. The bedding is made from renewable wood fibers that make it biodegradable and hence eco-friendly. It comes in different sizes and colors so you can choose based on mood and personal preferences. Finally, it has a unique odor control formula for 10 days and is 99% dust free to keep your environment smelling fresh. Want to see your hamster digging under bedding? Try the Kaytee Soft Granule Blend bedding that’s soft and comfortable. The bedding is made from the wood fiber is 99.9% dust free and is incredibly absorbent. As a result, the hamster bedding granules should offer a great cage environment for your hamster. This is the best bedding for hamster owners looking for an eco-friendly option because it has no chemicals. Also, it can expand up to 3 times its size which enhances its longevity. For the price, you won’t find many products that can deliver results better than the Small Pet Select bedding. This depends on the size, type, and quality of hamster beddings. You should buy beddings that replicate those in hamster’s natural environment. This helps satisfy its burrowing instincts. There are many types of beddings available, and it’s up to you to choose the best one for your kind of hamster. Price depends on the kind of material and quality, but most are relatively affordable. In the wild, hamsters can dig down up to 3 feet. Therefore, this means you need to have some depth to the bedding in the cage. Of course, you don’t have to put beddings up to 3 feet. Instead, aim to have at least 2 inches of beddings (that’s around 6cm) in the cage. This is sufficient for a domesticated pet. If you still want your hamster to enjoy and you have a big hamster cage, you can add an extra inch to make it 3 inches. There are many brands making beddings out there, and some are not safe for hamsters. However, they still sell because people lack enough knowledge to know the safe beddings for hamsters. Therefore, if you go out there to look for hamster bedding, ensure to do your due diligence before you hit that buy button. Your furry friend will appreciate it a lot. When working with hamster bedding, one thing that is inevitable is soiled beddings. This means you have to change them from time to time so that your hamster can live comfortably. As a general rule, once you notice your pet’s beddings are soiled, change them. Overall, you should change the beddings at least once a week. You may have to give the cage a thorough cleaning once in a while. Hamsters need safe and comfortable beddings for them to live happily and healthier in their cages. The type of bedding you need to buy depends on the natural habitat of your hamster. Make sure to pick a hamster bedding that is comfortable and non-toxic to your small pet. Not all beddings for hamsters are quality as some are dangerous. Avoid beddings made from cedar and pine. An excellent hamster bed should soak up urine, subdue bad odors, and provide a safe environment for your hamster to play on and live in. Fortunately, all the hamster beddings we have reviewed here are the best and will be worth the money. Purchase the suitable from the top 5 we have reviewed here!